My husband, Jerry is on a serious banana kick. He buys at least 2 bunches a week and sometimes can't keep up with them before they get too ripe. 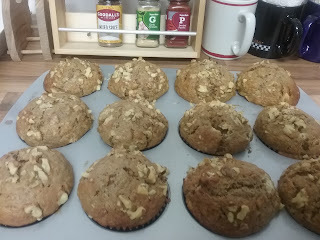 With 2 overly ripe bananas I decided to make Banana Nut Muffins. I found this recipe online and they came out perfectly! 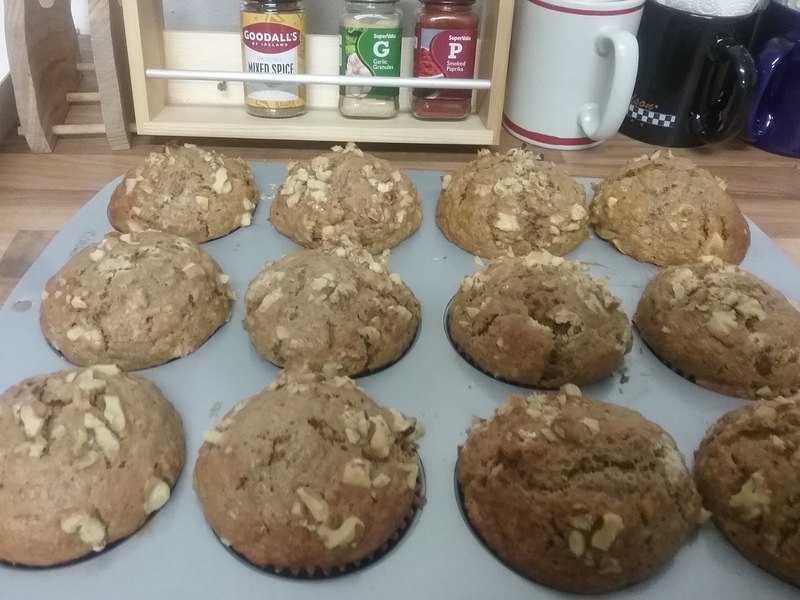 The "muffin tops" were very generous and the muffins had a wonderful light texture; not at all dense like some banana bread or muffins. 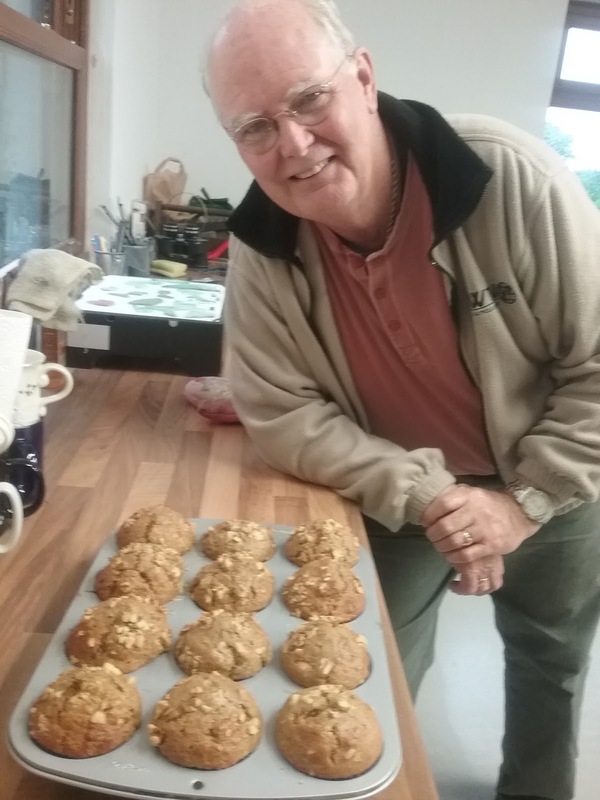 Jerry is about to dig into one of these freshly baked muffins! Muffins ready to pop into the oven. Preheat oven to 425 degrees. This initial high temp helps the muffins to rise. 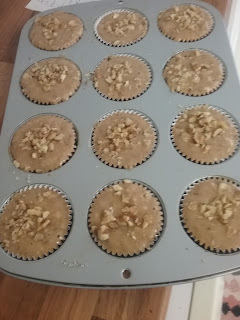 Line a muffin tin with 12 paper liners. In a large bowl toss together flour, baking powder, baking soda, cinnamon, and salt. Set aside. In a medium bowl whisk oil, white and brown sugar, eggs, milk, vanilla and banana. Pour wet ingredients into dry ingredients. Stir gently with a rubber spatula. When ingredients just come together fold in 2/3 cup chopped walnuts. Divide batter among 12 muffin cups. Top with 1/3 cup chopped walnuts. Bake 5 minutes at 425. Reduce heat to 375 and bake another 12-15 minutes until toothpick comes out clean. NASTY STINGING NETTLES TAKE ON A NEW PURPOSE! 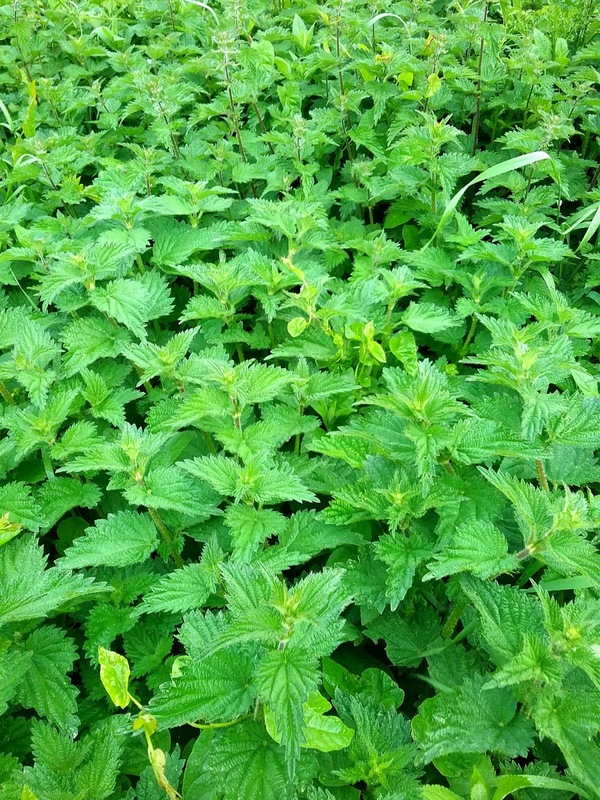 Nettles may be Ireland's most prolific weed. They are everywhere and if you like to garden, like me, sooner or later no matter how careful you are, you will be stung. Because I am such a sensitive creature I tend to get a very nasty lingering bright red painful, burning itch and sometimes the skin that has been touched even swells. Not nice! But I just learned recently that the Irish have used nettles to make soup for years. 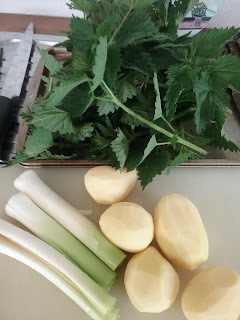 When food was scarce they were a nice change from potato soup, but just as crubeens , which are pigs feet (Go to: http://cookwithcindy.blogspot.ie/search?q=crubeens if you want to make pigs feet yourself) are not so popular today, nettle soup is no longer a staple. I have mentioned the soup to a couple Irish friends and they get this wistful, far-off look remembering a nourishing and delicious dish from their past. I garnished with a full-fat Irish plain yogurt. I made up the recipe and since making the soup have done some research to learn that often milk or cream is added. I thought this soup was perfect without it. There is something very satisfying about going into your back yard and gathering ingredients for dinner. I also learned that nettles are very good for you; high in iron, calcium, potassium, and also vitamins A and C.
I think next time I would add a clove or 2 of garlic. Again, I did not want to use it this time as I wanted to really taste the nettles. Some recipes also call for herbs: lemon thyme, marjoram...variations are endless. I even found recipes with oats or rice. 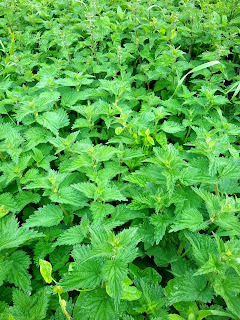 Pick the nettles carefully wearing gloves. Choose young leaves. Wash and remove leaves from the stem. 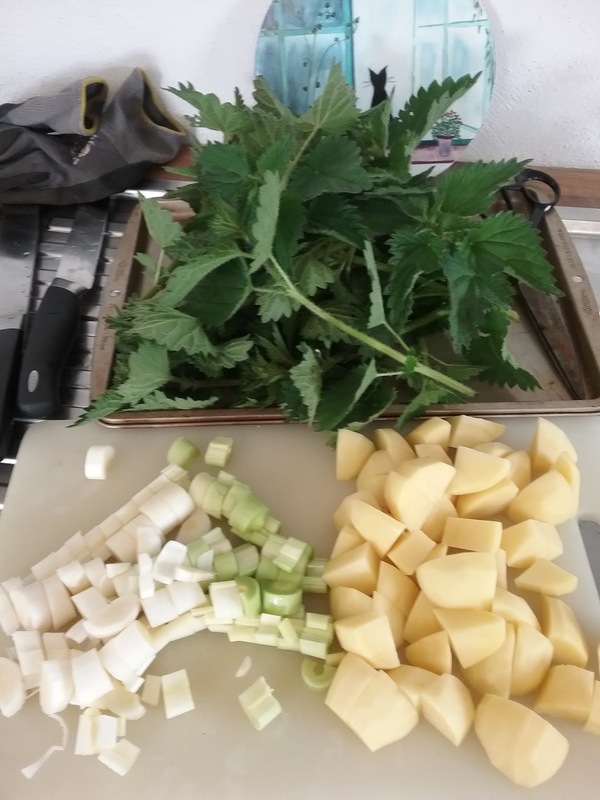 I am not sure where you would 'source' nettles if you don't have acres of them growing in your back yard as I do here in Ireland, but you might get them at a Farmer's Market. Peel and dice potatoes. Wash leeks thoroughly. Dirt collects in the leek layers so you may have to slice down the middle to get all the dirt out. Chop the leeks. Cook potatoes and leeks with salt and pepper in the butter for 10-12 minutes until potatoes are gently browned. Add chicken stock (vegetable stock or water) and bring to boil. 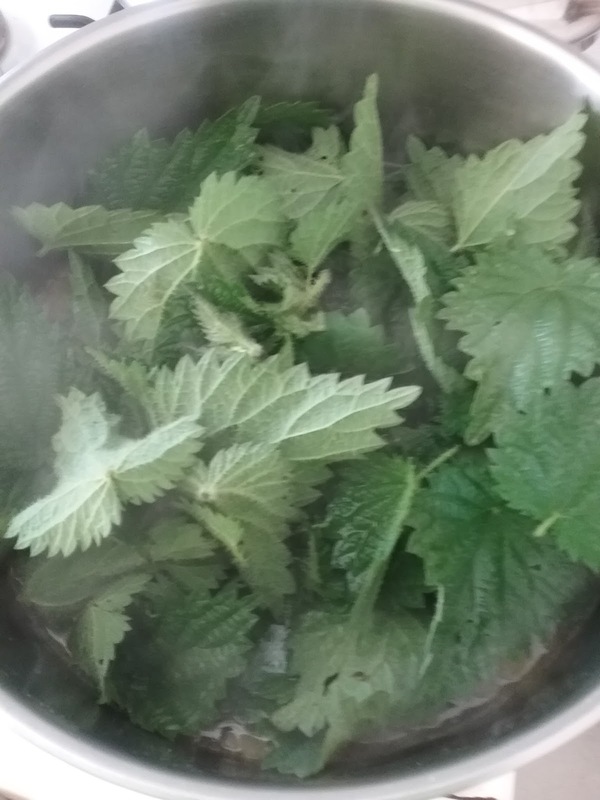 Carefully drop in nettles. Lower heat, cover and steam for about 30-40 minutes. As the nettles cook they lose their stinging quality. Cool completely and blend in a blender until smooth. Taste and correct seasoning. I could not decide on garnish design so tried a couple different ones. 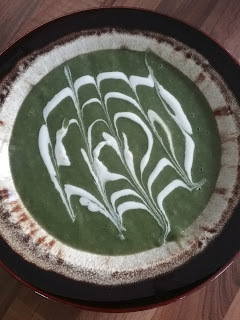 The soup is reminiscent of asparagus and spinach, but definitely has its own special flavor. 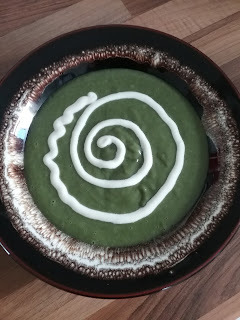 The soup also has a bit of a spicy bite! Rich, quite thick and extremely delicious! I think Nettle Soup will become a staple in our Irish home! and a lump of hairy bacon that she boiled up in a kettle." All for today from Spiddal, Co. Galway, Ireland!